Well, I finally did it. I got a denim button down. I've been to for what feels like forever, or at least a few years, but I just hadn't found the right one for the right price. Since I've been focused on getting some good quality, long-lasting shirts lately, I couldn't resist when J. Crew Factory was a one day sale on certain items a week or two ago, so I finally ordered this one. It's great quality (real denim rather than chambray), and I can already tell that I'll be wearing it often. 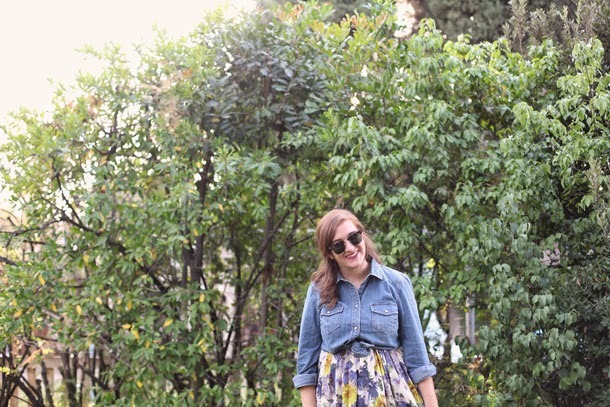 I paired it with this floral Jack by BB Dakota dress, which I picked up at Goodwill last week for $9. The top button on the dress is broken, so until I fix it (or resort to a safety pin), I'm settling for wearing it as a skirt. Between this gorgeous dress and that lovely floral skirt I found over the summer, I am killing it at finding BB Dakota pieces for super cheap at thrift stores this year. I'm beginning to think that I'll never need to buy anything by the brand for full price from now since the universe obviously is planting things in thrift stores for me to find. Thanks, universe! Other than actually a few productive things I've been doing lately, I've been having a fun past couple of days. I saw "This Is Where I Leave You" with my friends Adam and Miller on Monday, and it was better than I expected. I've been meaning to see for at a month or two now because of the incredibly cast, but it didn't look like it'd be too great so I didn't get around to it until this week. It certainly wasn't the best movie I've ever seen, but anything with Jason Bateman, Tina Fey, Kathryn Hahn, Cary Stoll, Ben Schwartz, and Connie Britton is worth seeing. We ended up getting a couple drinks after and staying out way too late, but it was a really fun night. Yesterday, I went to a cool downtown area near me with my friend Alyssa for lunch and shopping, where I got to use some store credit to Buffalo Exchange. It was a great day, but I'm putting myself on another shopping ban. I had been good for months, but I've added too many new pieces (as cheap as they've been) to my closet lately, and I really need to just stop. Someone send help. I'm looking forward to the rest of the week of dressing up for Halloween at work, Oktoberfest, and seeing a Harmontown taping over the weekend. I've been absolutely terrible at commenting on blogs lately, so please tell me, what have YOU been up to lately? Suuuuch a cute outfit! Every single piece is so adorable. And that dress is a really lucky find. I cannot wait to see it in it's entirety! It's definitely a struggle to not add new pieces, especially when you find great ones at awesome prices. 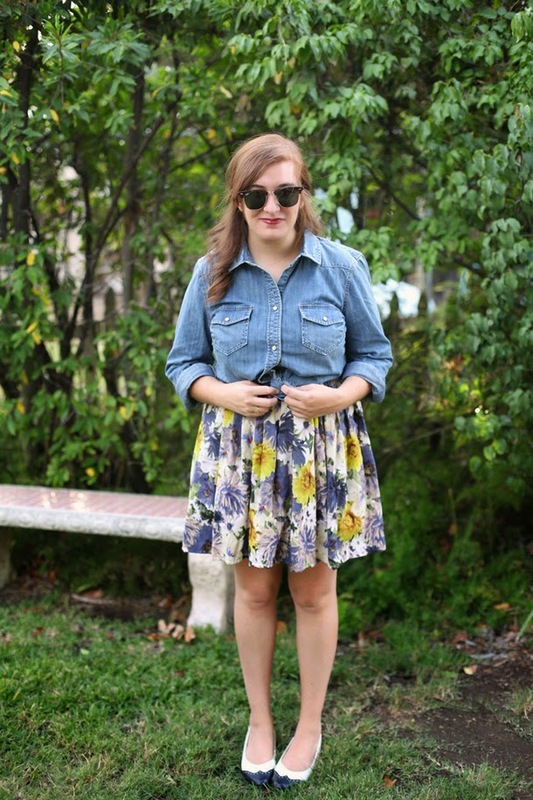 Especially when things are fairly seasonless and timeless like a denim shirt or the floral on that dress. Its great. Can't wait to see how you style it as a dress. 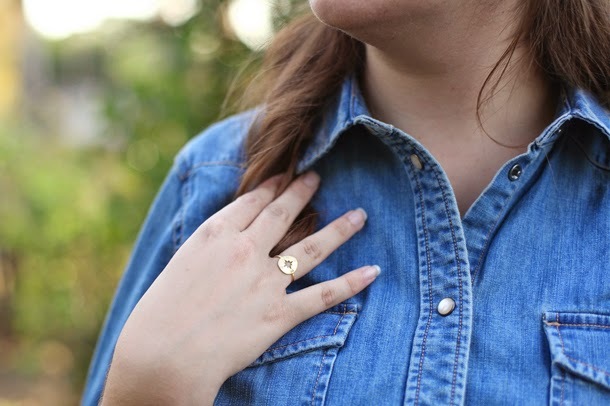 Totally cute outfit, that denim shirt is perfect! I have one that looks similar from The Gap that I love. 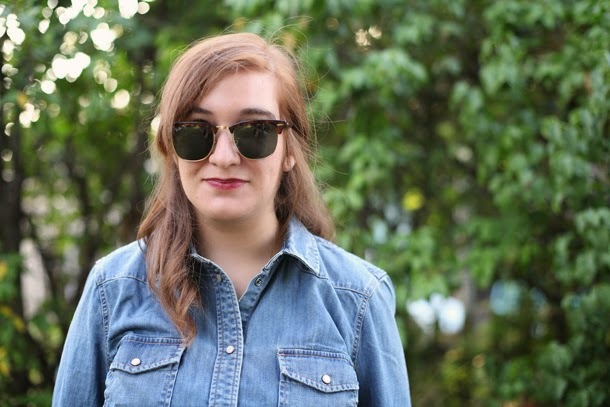 Denim shirts are so versatile and can be worn all seasons with so many different styles. You certainly can't say that about many clothing items. Ah, this is such a cute outfit! I have a hard time finding a good denim shirt, too, I'm so glad you finally found one for yourself! And I love it with that pretty dress (Which I can't wait to see as a whole when you get the button fixed). Such a great find! I haven't been up to much other than housewifery and finally forcing myself to get started on my alterations/mending pile (which is mostly just hemming things up, or re-sewing buttons and straps back on.). It's a big pile, and there's lots of clothes in there that I could be wearing right now if I wasn't so lazy about it, haha! Such a lovely outfit! I love the yellow and blue combo. The print on that dress (skirt) is adorable. 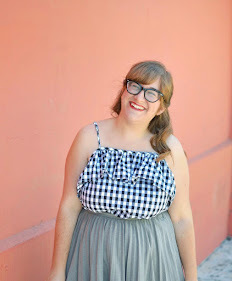 I still need to try wearing my dresses as skirts (or wearing a skirt on top of a dress)! Such a good idea and great way to remix outfits. Ahh, this outfit is so puurrrty! 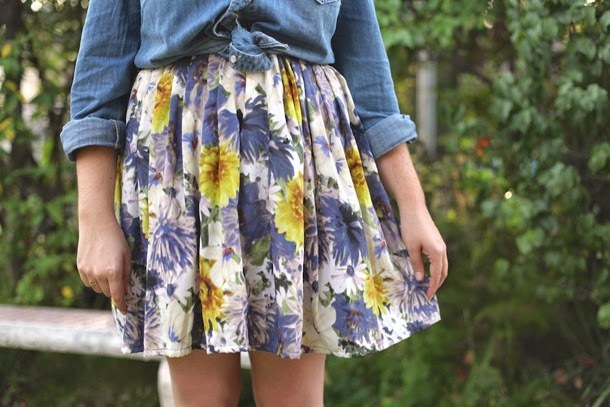 I love the way the denim shirt looks with that floral dress/skirt, just lovely! Adorable dress!! You always find great stuff at thrift stores!! Seriously though, you look fantastic. So, genuine question here- is chambray not as good of quality as denim? I thought it was just that one is a plain weave and one is a twill. Is that what makes the difference? I've been confused about the two fabrics for a while, so am just going to ask!